This day, we took a day trip to Arashiyama, to see the famed bamboo forest. It's only a 15-minute train ride from Kyoto station. But first, a little about our lunch plans. In my research, I'd come across this famous beef place called Otsuka at Arashiyama. It serves wagyu steaks as well as the legendary Murasawa beef, which is supposedly the ultimate wagyu beef named after the producer. Only 80 cows a year are produced and Otsuka serves it at prices that will not bankrupt your bank account. Some of my friends recommended yakiniku restaurants in Osaka but we prefer our beef cooked for us, so we decided that our splurge meal on Japanese beef would be on steak. Otsuka only opens for lunch from 11am to 2.30pm five days a week. I'd tried making reservations but was told they didn't have any the day we planned a visit. So we did the typical kiasu Singaporean thing when it comes to food - we strategised. When we tell people we're going to Kyoto/Osaka mainly to eat, people laugh. Why? We take our food very seriously. We arrived at Arashiyama at 10am, an hour before the restaurant opened. To get to Otsuka, exit from the south gate of the JR Saga-Arashiyama station, turn right and walk down a small lane next to the train museum. After about 5 minutes, you will reach this sign next to a small road. Otsuka is the last house down the lane. We wrote our names on the wait list placed outside the restaurant (at 10.10am, we weren't even the first, another person was more kiasu than we were!) Then we headed out to the bamboo forest which was very close by. 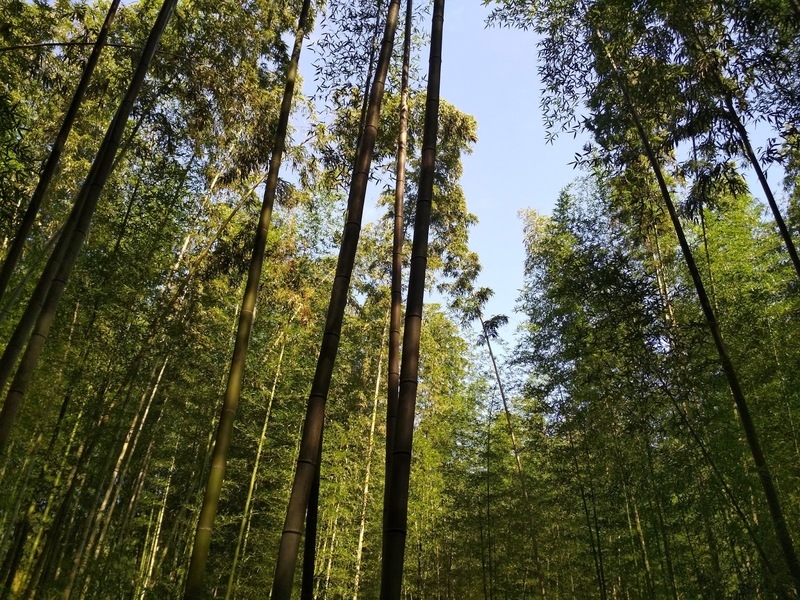 The bamboo forest is simply magical. The fresh scent added to the ethereal quality of the place. Definitely well worth a visit. We saw some clueless tourists haplessly trying to drag their luggage bags up the cobbled path of the bamboo forest. Please don't do that - you're just killing yourself (and your bags). Just before 11am, we went back to Otsuka to claim our spot. By then, the waiting area outside had almost filled up and more than 10 parties had written their names on the list. On the dot at 11am, a waitress came out to call the first party. We were next. The restaurant is tiny, with only four tables and some bar seating. This means that if you don't have reservations or didn't leave your name early, you're likely to have to wait for more than an hour and I've heard that they sometimes run out of choice cuts early. Our verdict? We've never tasted steak like this ever. The Murasawa steak was so fatty and tender it melted in your mouth. The flat iron steak was a surprise - it was the fattiest of the lot and like slicing through butter. The short plate beef set was ordered by Lesley-Anne because she's not a huge fan of beef and didn't want to splurge on what she calls "hunks of meat". But the beef turned out to be so super tender and the marinade very, very tasty. Fantastic value for money. Note: If you like steaks for the beefy taste, you might actually not be used to higher grade wagyus, as the taste is less intense. But we enjoyed the experience tremendously - definitely something to try when in Japan. When we left the restaurant, Otsuka was only seating party no. 9 (who was already waiting when the restaurant opened) and the waiting area was full. So follow my tip and go early! Stomachs full, we went to the Tenryu-ji temple. You will come across an entrance to the temple in the bamboo forest but we realised later that there is another entrance on the way to the Togetsukyo Bridge, so you don't have to go back through the bamboo forest to visit the temple. We paid Y500 each to visit only the temple grounds, not the buildings. The gardens are very beautiful. I wish we could have seen them in autumn, they must be stunning. After the temple, time for ice cream! 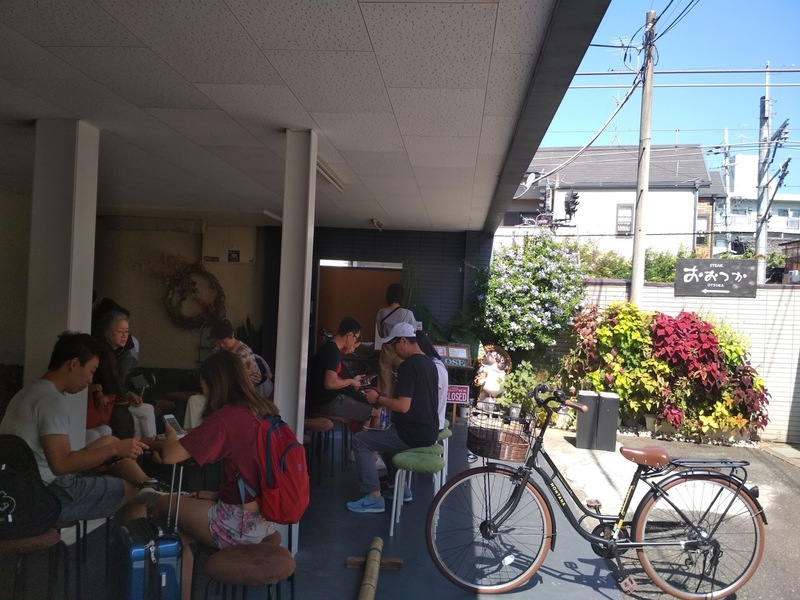 There's a popular shop at the entrance of the bamboo forest selling soft serve matcha ice cream for Y350 but we bought from an elderly man in a less commercial shop just across the road for only Y200. Support the elderly lah. The last place we visited at Arashiyama was the Togetsukyo Bridge. It stretches across the Katsura River, where many people were playing or relaxing. Very scenic. Initially, we only had Arashiyama planned for the day, but we ended our visit quite early in the day, so decided to also go to the famous Fushimi-Inari shrine. It's known, of course, for its iconic orange torii gates which wind up the mountain. The hike up the full trail of torii gates is about 4km. If you're as unfit as I am, that's a terribly daunting prospect and you're likely to walk just two or three sections before returning back down. The thing is, the lower sections tend to be jam packed with equally unfit people, so getting a nice photo without being photo bombed is a challenge in itself. The higher you go, the fewer people, the nicer the pics (duh). Tip: the first stretch of torii gates start on the right hand side of a temple. On the left hand side however, there is a short track up the mountain. This is for people to take a short cut down the trail without having to retrace their steps the entire way. So if you take that track up, you'll reach the end of the second section of the torii gates within 5 minutes or less, and you can start your trek upwards from there, bypassing the initial crowded sections. You're welcome. After a full day of sight-seeing, we returned to Kyoto station for dinner (more food!) 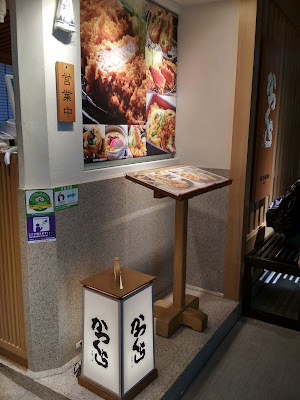 and decided to try Katsukura, a katsu (pork cutlet) restaurant with good reviews. It's located on the 11th floor of Kyoto station, which is a food row. Here, you grind your own sesame seeds in a bowl to create the sauce for your katsu. Lesley-Anne and I are not fans of pork, so we opted for prawns instead. Very generous portions. You get unlimited refills of barley rice, salad and miso soup. More importantly, the batter is excellent - crunchy and not too heavy. A good choice if you're a fan of katsu.